There comes a time in the life of almost each one of us when we have to make a choice between taking life head on or surrendering before circumstances. Choices are made as per our priority, environment and the gene that drives us to stand with our decision. Sometime it is due to our physical weakness and sometime it is our attitude. Flipside literally is the other side or the side which is not that positive, which is not that bright. I grew up with some quotes occupying sizable memory of my mind - the grass on the other side looks greener; only the wearer knows where the shoe pinches or only the corpse knows what is going on in the grave; Elephant has two set of teeth - one to show off and the other to chew, etc etc. When we look at the life of successful people we get lured by their followership, their living style, their admiration, and their sense of achievement. We look at their present status. But when we start learning more about them and their journey and the hardships that they faced we become more rationale. Our understanding becomes better and at times we learn that the kind of problems they faced, the kind of physical torture they experienced, the kind of resource crunch they had, it was almost impossible to excel at what they decided to do and contribute. Then there are people who found opportunity at a time when they were facing the low at life, they transformed their weaknesses into opportunity by taking challenges and finding real purpose of their existence and life. Adam Jackson has collected such great stories of people from across the globe and compiled them in such a remarkable and convincing way. This is what The Flipside as a book is all about. In one way it is a motivating read for the ones who have sustained linearity in their career and have not experienced hardships of life on the other hand it is packed with such strong nutrients to them who are facing the brunt of time and planning to give up on life that they can learn to stand up on their own and convert their weaknesses into opportunities. The motivation to develop 'logotherapy' by Viktor Frankl who survived a holocaust is something which inspired me most. The whole science of finding meaning to life and to draw people to understand that meaning of life to them is something which in many ways changed the way psychologist thought addressed this issue. We all have grown through the teachings that for each one of us life has a meaning. What Viktor conceived while suffering during the holocaust became one of the best contributions in the domain of psychology. He learnt that main motivation for living is our strong will to find meaning in life and that led him to develop logotherapy. The book is full of such experiences of people who developed products and services, who found real meaning and call from within and pursued that and excelled. The flip side drove them to think of the cause of their existence, it gave them strength to prove their point through their excellent performances and it provided them with an opportunity to transform themselves into a person who stood by one’s call. The examples of the contributions made by Graham Bell, Thomas Alva Edison, Michael Bloomberg, Louis Braille, Richard Branson, Harland Sanders, Walt Disney, Amit Goffer, Spencer Silver, Richard Turner and many others make the book rich in its content. I thoroughly enjoyed reading this title for two strong reasons. One, that it is full of well written true success stories and another is that Adam talked about many of my familiar and favourite works e.g., Blink by Malcolm Gladwell, Predictably Irrational by Dan Ariely, Good to Great by Jim Collins and subjective well-being by Ed Diener and alike. 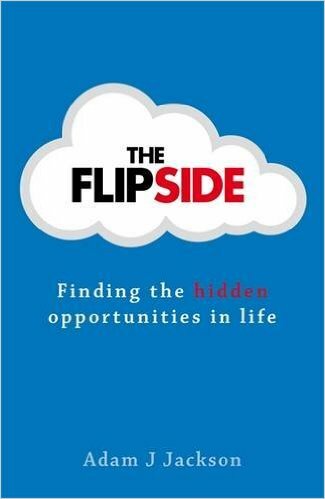 The life story of Dan Ariely and his contributions are in itself a testimony to the flip side he experienced. As a student of Business and Management I would like to relate many instances with the Theory of Constraints. I think it makes lot of sense to explore the limiting factors and to see how organizations have responded to the call of the time. My belief has been that people living in scarcity of resources and suppression demonstrate lot of inner strength to prove their meaningful existence and the competency to excel in much better way as compared to their counterparts living with all comforts of life, leisure and luxury. Adam has helped me strengthen my belief. Though at some places I found the flow being broken and then beginning is sudden and at some places the ends are left loose, yet I recommend this book to all those who are seeking excellence and who believe that our perception towards life makes what and how we chart out our journey further.